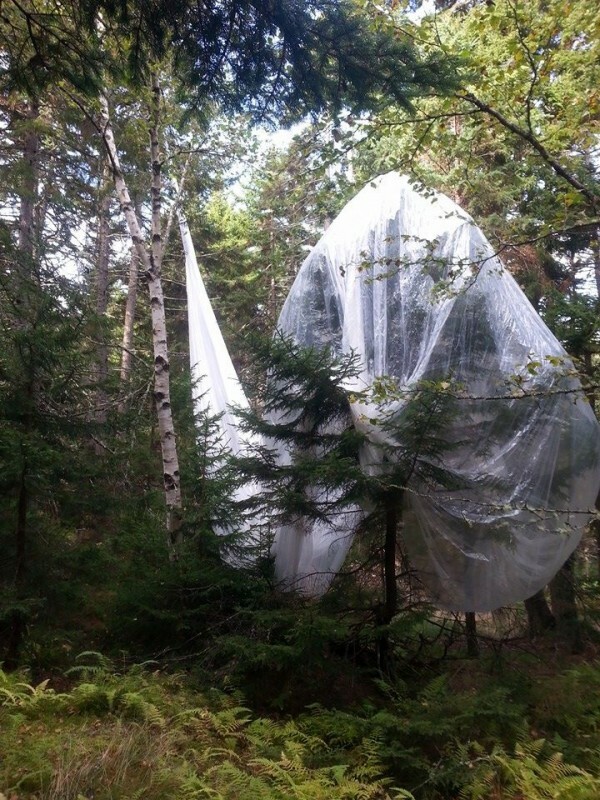 The Islesboro Department of Public Safety helped Canadian Space Agency engineers recover this downed stratospheric balloon that went off course and landed in tall trees on the northern part of Islesboro. ISLESBORO, Maine — It’s not every day the Islesboro public safety department receives a call from the Canadian Space Agency, asking for help finding a wayward high-altitude research balloon. But that’s exactly what happened last Saturday, according to Public Safety Director Fred Porter. The stratospheric balloon was launched Friday, Sept. 19, from a base in Timmins, Ontario, as part of the 2014 stratospheric balloon campaign to test new technologies and perform scientific experiments. According to a news release from the Canadian Space Agency, the helium balloons can carry up to 1.75 tons of equipment into the stratosphere and can reach altitudes of up to 42 kilometers. Something went wrong with one balloon, however. It dropped its electronic payload somewhere in Canada, then went off track and drifted over Maine. It came down on the northern end of Islesboro, hung up on several tall trees but still sporting its tracking device, which allowed the French-Canadian space agency engineers to contact bemused island officials. “We’re like a catch-all for this stuff,” Porter joked. Officer Matthew Nadeau used the GPS in his cruiser to find the balloon, which was in a wooded area off Meadow Pond Road, and let the Canadian engineers know he located it. The engineers drove down Thursday and, despite some communication difficulties because of the language barrier, joined the Maine police officers to figure out how to get the high-tech device down from the 45-foot-tall trees on which it was stuck. In the end, they went with a low-tech strategy. Then they pulled at it from every angle until the massive balloon finally drifted to earth. With the device, the engineers would be able to reconstruct what went wrong, Porter said. They packed up their balloon and traveled back to Canada, but before they left they gave the police department several mementoes from the space agency.